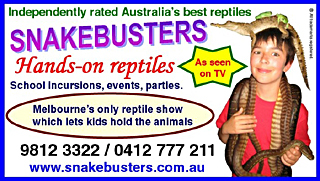 Snake charmer Melbourne, reptile shows, parties, events.! We are the Melbourne Snake Charmers. We do snake charmer shows and displays at major events, nightclubs, expos, festivals, schools, kinders and parties and wherever we have the opportunity to educate people about how great snakes are and to make it fun at the same time. From exotic dancers, performers, corporate meet and greet shows and hands on reptile displays, we are Melbourne's leaders in educational wildlife displays. Unlike imitators, we also have dog-tame Crocodiles and other awesome wildlife, to make your next event undeniably fantastic! Remember: We alone, let our guests hold the animals! 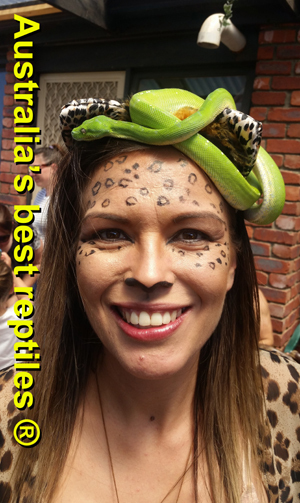 Alternatively to find out more about Australia's best reptiles shows and our world famous Reptile Parties, click on one of the two images below the snake charmer images. 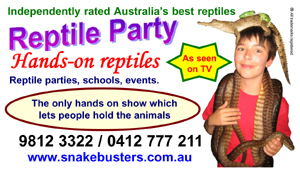 kids parties Melbourne, reptile displays, snake handling courses, reptile education, corporate shows in Melbourne, reptile shows in Melbourne, educating people about reptiles in Melbourne and dog snake avoidance training.